We do not plan to have a litter in our home until mid to late 2019. We are happy to discuss our upcoming breeding at any time. Feel free to contact us. Be aware that due to our very limited breeding program we are able to be particularly selective about where our cherished puppies live. They come with a future with great potential and lifetime of support. Not everyone fits into our model of being a part of our family. That is fine. If you are not looking for a lifetime of support and involvement, no problem. We are happy to try to help you find another breeder so long as you are looking for a reputable, respected, preservation hobby breeder. Lots of adjectives there but how else are you going to differentiate from the BYBs and puppymill breeders! As things have worked out we generally breed a litter less frequently than every 18 months, often more like every 2 years or more. When we do breed a litter it is after much thought and preparation has gone into examining pedigrees and dogs that will best suit our girls for health, temperament, trainability, hunting ability, and breed type. In addition to our dogs being titled and competing in a variety of venues, our dogs are only bred if they pass a series of health tests. We believe that all breeding dogs should have clearances on as many likely disease processes as reasonably expected. Many decisions when breeding are compromises; trying to make the best forecast based on the facts. Sometimes the facts aren’t apparent. We hope that the health testing we do reveals more of the facts and allows better breeding decisions. Our puppies are raised in our home with our family and other vizslas around constantly. They are socialized to many different people, dogs and situations before going to their new homes. Most puppies are well on their way to being house and crate trained when going to their new homes between 8.5 and 10 weeks of age. 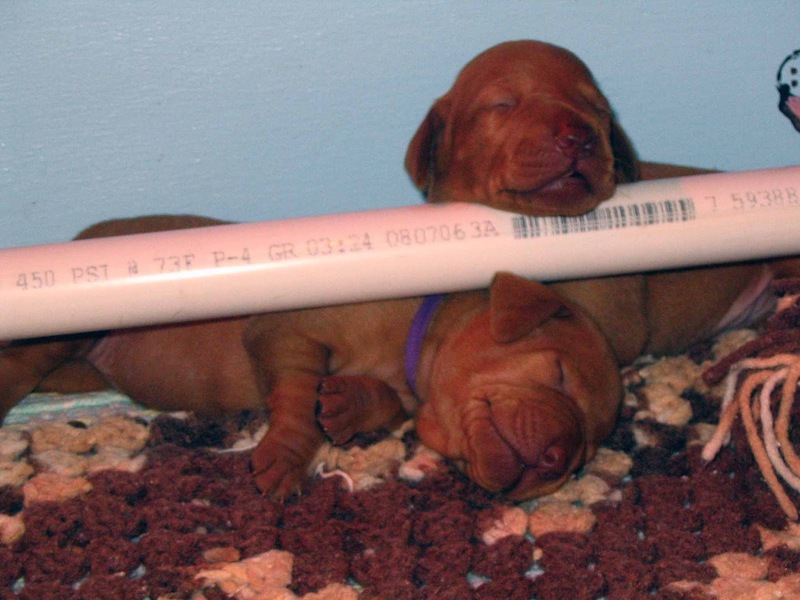 Our puppies are sold on Limited Registration and co-ownership. Depending on the situation this may be lifted if it is in the best interest of the puppy. 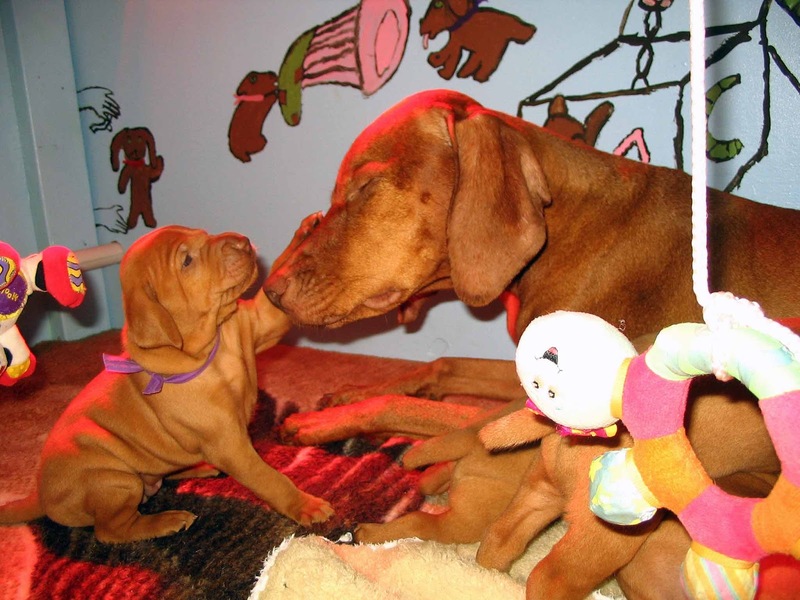 While we do not place puppies in only show homes, we do prefer homes that are going to participate in performance activities to optimize the traits of the dog and ensure its future happiness in its home. Our belief is that a busy, active, well-trained vizsla is one that will make a happy, well-adjusted member of the family. Of course we are more than happy to make referrals to reputable breeders and helping you find a great puppy from a reputable, responsible breeder. I enjoy nothing more than helping people who want to “do it right”. 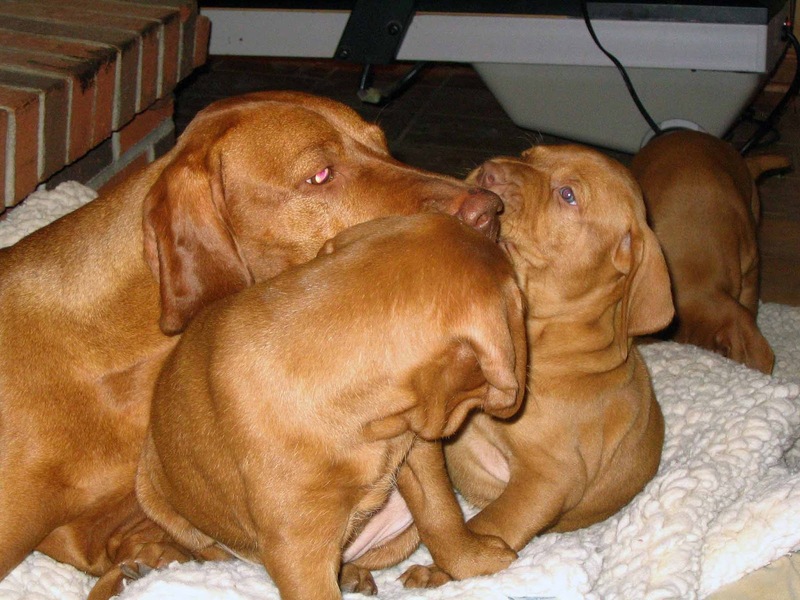 We breed very infrequently and as such more often make referrals to other breeders we believe to be of high quality. 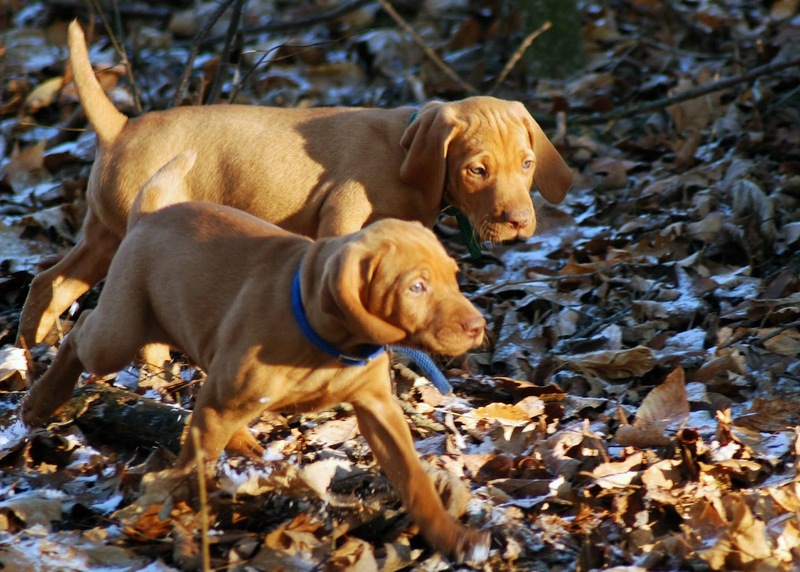 Puppies learning about the woods before they go to their new homes. Puppies trying out new surfaces, meeting new people and having new experiences. 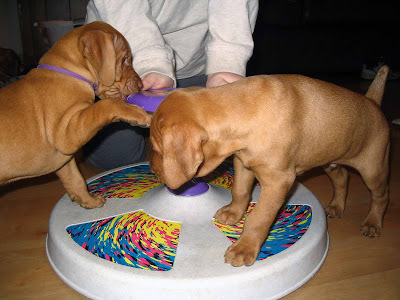 Puppies playing in the family room.